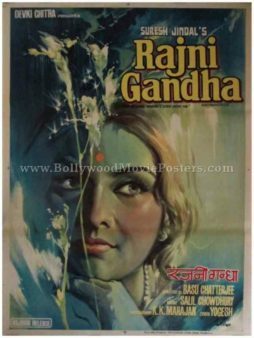 Old Bollywood movie poster of the award winning Hindi film, Rajnigandha (1974) for sale. 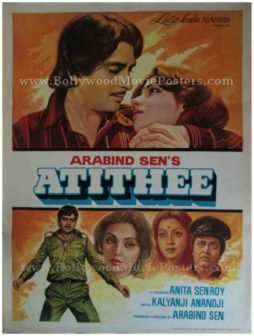 This is an actual surviving old Bollywood poster for sale of the 1974 Hindi film directed by Basu Chatterjee that starred Amol Palekar and Vidya Sinha in lead roles. A breakaway alternative film, Rajnigandha depicted realism at a time when potboilers were ruling Bollywood in the 1970s. Rajnigandha marked the debut of actress Vidya Sinha and actor Amol Palekar, both of whom went on to work with Basu Chatterjee in many subsequent films. 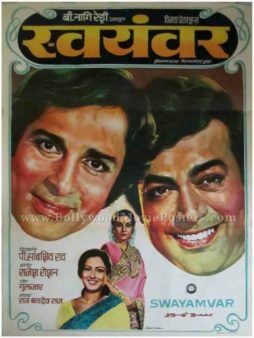 Rajnigandha won the Best Picture, the Popular Award and the Critics Award at the Filmfare Awards in 1975, making this old Bollywood poster highly collectible! 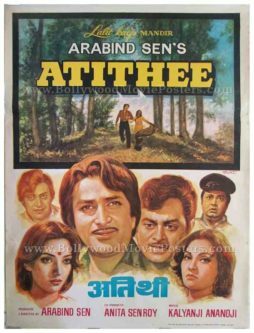 Printed and circulated during the original first release run of the film (early 1970s), this old Bollywood poster for sale was originally designed for publicity of the film but never ended up being used. This old Bollywood poster for sale features stunning hand painted artwork. Originally hand painted on canvas by a leading Bollywood poster painter, this old Bollywood poster features actress Vidya Sinha in a stunning hand drawn portrait. The soundtrack of Rajnigandha was memorable. The hit song “Kai Baar Yuheen Dekha hai,” won singer Mukesh the National Film Award for Best Male Playback Singer.